Parts of the citadel at Mycenae remain little understood (even after over 100 years of excavations), with most research and visualization focusing on the major buildings or sectors inside the fortification walls, such as the megaron, the grave circles, and the Lion Gate (the main entrance). As the supporting structures and terrain of the hill were cleared and surveyed (especially those east of the palace, during the early part of the 21st century), it became clear to archaeologists that the vibrant nature of the activity areas on the citadel needed additional investigation. For over ten years, Christophilis Maggidis (Dickinson College) has expanded our knowledge of ancient Mycenae by excavating the lower town. At the same time, he conducted investigations in and around the subsidiary structures on the citadel, especially the so-called Artisans' Workshops and the House of the Columns--the two structures needing visualizations in order to help understand their original form, function, and impact on the citadel's spatial organization beyond the palace area (in the photo at the left: 1-Lion Gate; 2-Shaft Graves; 3-megaron/palace; 4-Artisans' Workshops area; photo © Christophilis Maggidis, used with permission; hover over to enlarge). The Artisans' Workshops area (circled on the plan to the left; hover over to enlarge) consists of two roughly parallel sets of rooms, probably the surviving basement level, separated by a central hallway; the area covers about 27x28m and was certainly originally at least two stories tall. A stairway at one end led up hill to other structures and upper floors. The finds from the rooms (such as, gold leaf, slag, fragments of semi-precious stones, and pigments) indicated the building's function and led archaeologists to gave the complex its current designation. The House of the Columns (named for the series of column bases uncovered there) just below and adjacent to the Workshops seems to have been a rather luxurious complex of multi-storied structures around a courtyard and storerooms. The complex might have served some ancillary function to the main palace. The marker below points to the location of Mycenae. The citadel of Mycenae (legendary capital city of King Agamemnon, who was the leader of the Greek forces during the Trojan War) was built on a naturally defensible hill with a commanding view and plentiful fresh water nearby (see the image of the citadel from the northish at the left looking toward the plains; image © Christophilis Maggidis, used with permission; hover over to enlarge). In its final form, the citadel covered 30,000sq m (over 7 acres) enclosed by a 900m-long circuit wall. 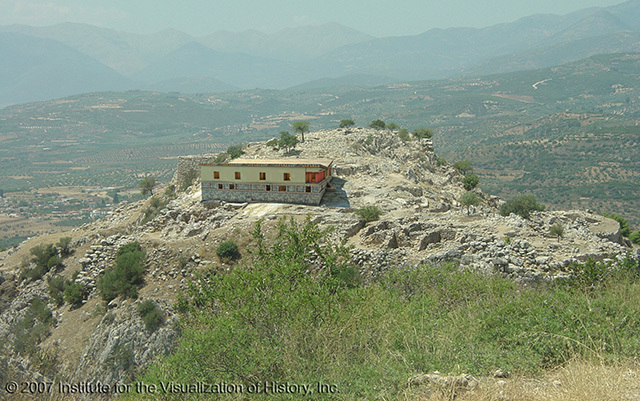 The citadel rests on a low rocky hill rising 278m above sea level and approximately 40-45m above the surrounding plain. 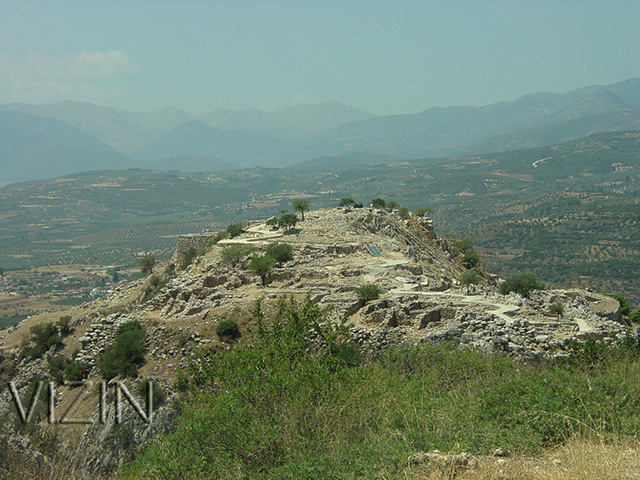 The hill of Mycenae combines a strong geopolitical location that controlled access points to and from the Argolid, and a commanding view of the Argive plain to the south below. Located about mid-way between the towns of Corinth and Argos and controlling the natural pass from the Isthmus to the Peloponnese, Mycenae was a royal stronghold that included extensive fortifications, granaries, workrooms, guardrooms, shrines, and a few private dwellings situated around the central palace complex. The palace consisted of a traditional, central megaron meeting hall, throne room and courtyard with adjacent private quarters, storerooms, guard stations, and administrative rooms. The site seems to have been first occupied in the Neolithic period (prior to 3000 BCE). 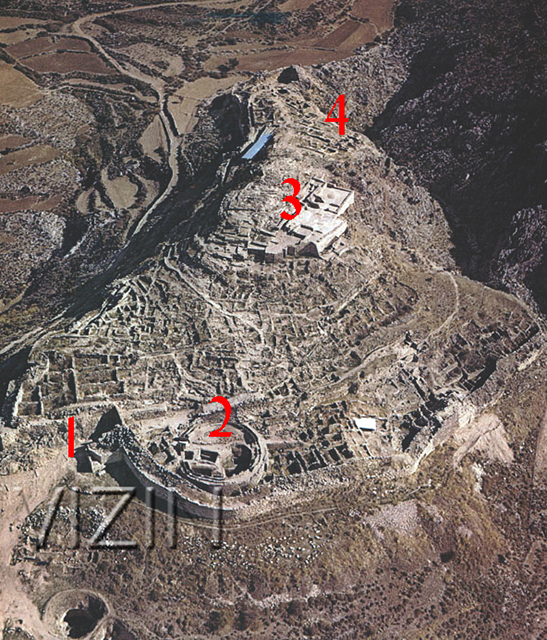 Habitation continued throughout the Early and Middle Helladic periods (Early and Middle Bronze Ages; c.3000-1600 BCE), and the first palace complex was probably built at the beginning of the Late Helladic period (Late Bronze Age). Initially, the mid-14th c. BCE fortifications probably followed the natural topography of the hilltop, but they were later enlarged to the south and west. In its final design (completed at the beginning of the 13th c. BCE), the citadel added a sally port (or a secondary secure entry or escape doorway near the rear of the citadel) and internal access to an underground water supply (see the plan at the left; image © Christophilis Maggidis, used with permission; hover over to enlarge). It was at this time that the monumental Lion Gate entrance was constructed. The citadel and palace of Mycenae were destroyed at the end of the Late Helladic IIIB period (c. 1200 BCE). During the subsequent Geometric period, only a few small houses occupied the summit of the hill. In the Archaic period, a temple was built on the summit. The site continued to be inhabited until the end of the 3rd century CE. Excavations on the citadel began in 1841, with the most well-known undertaken by Heinrich Schliemann and others after 1874. Work on and around the citadel, especially in the newly found lower town, continues today under the direction of Christophilis Maggidis (Dickinson College). 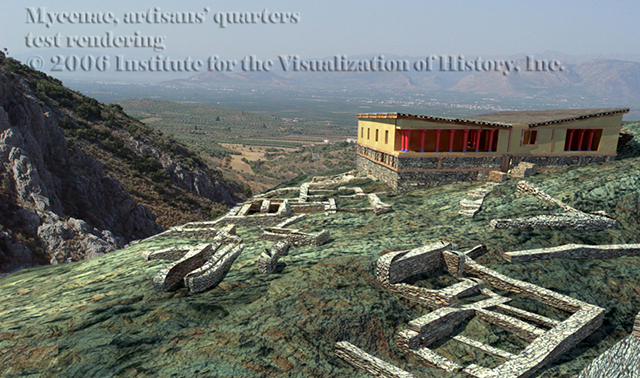 The Learninig Sites team was called upon by our sister organization, the Institute for the Visualization of History, to help with the modeling. We began with the Artisans' Workshops. The first steps in understanding an ancient structure usually consist of understanding the existing remains. The as-excavated walls and spaces needed to be accurately modeled first in order to have a precise and detailed basis upon which to extrapolate about the as-built workshops. We were given photographs of the extant remains (to use as texture maps) and plans of the spaces and topography (from which a 3D terrain model could be created). Together they provided enough evidence for us to learn about the ancient construction so that the walls could be virtually rebuilt (some of the excavated walls modeled and textured, and the workshops re-created and viewed in context at the left; hover over to enlarge). Maggidis provided us also with sketches of what he believed the Workshops may have looked like, at least regarding general massing, roof pitch, and location of columns. These drawings along with the photos and plans formed the basis for our models (see a contextual rendering at the left; hover over to enlarge). 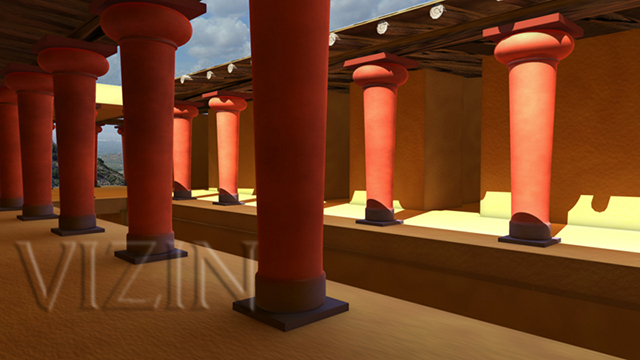 Translating hypothetical reconstructions into 3D models allows for testing what one has in mind, turning flat 2D sections and elevations into navigable spaces, and beginning to see ancient lighting and circulation from the point of view of the inhabitants. 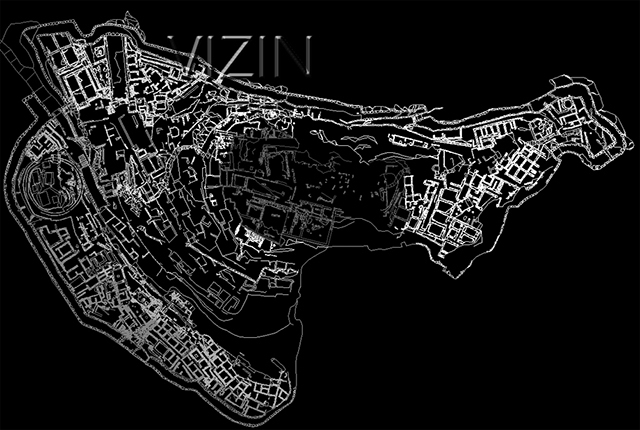 Thus, for the first time, the subsidiary structures of the citadel came into sharper focus; the visualizations could serve as points of departure for further hypotheses about how the ancient settlement was organized, how the ancient Mycenaeans spent their time, and how the architectural arrangements of Late Helladic citadels were planned. The remaining bits of the project are on hold. Rendering from our model showing a view of the interior courtyard from the downstairs (hover over to enlarge). 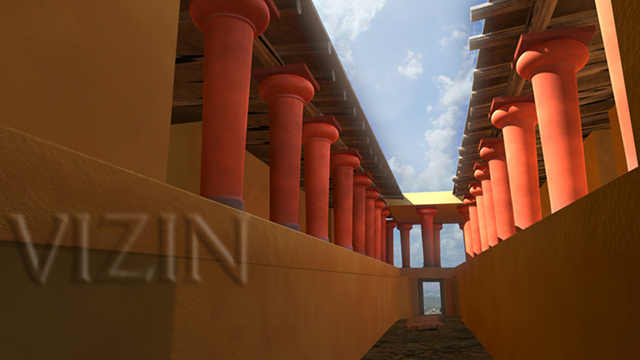 Rendering from our model showing a view of the interior passageways of the upstairs spaces (hover over to enlarge). 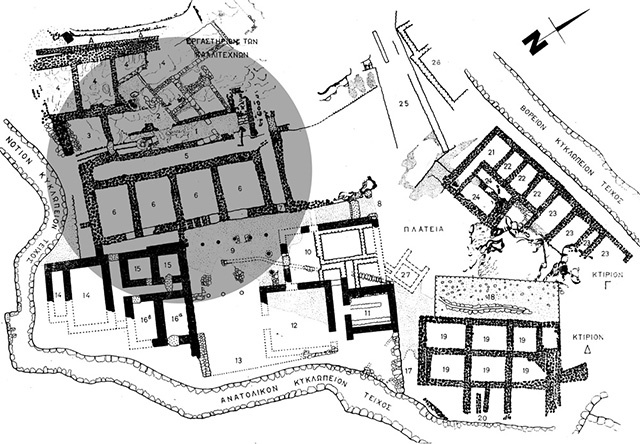 1983 "Mycenae," p.23-72 in Late Helladic Citadels on Mainland Greece, Leiden: Brill (Monumenta Graeca et Romana vol. IV). 1966 "The East Wing of the Palace of Mycenae," Hesperia 35:419-26. 1880 Mycenae; A Narrative of Researches and Discoveries at Mycenae and Tiryns, New York: Blom. page author: Learning Sites, Inc.
© 2019 Learning Sites, Inc.